Did you know pasta is a superfood? 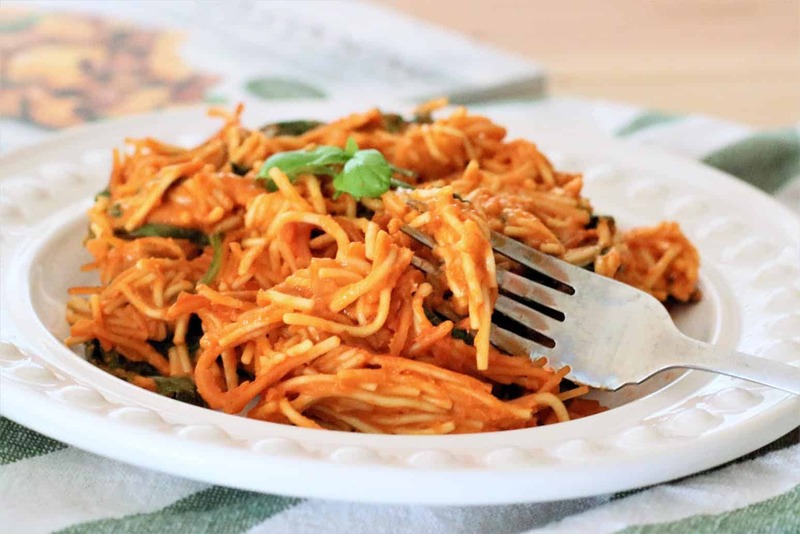 Well, okay, maybe I’m stretching that a tiny bit, but pasta is such a versatile vehicle that can deliver meals in minutes (literally) while providing your body with stellar nutrition. Case and point, Fresh Italian Cooking for the New Generation, the latest and greatest Italian cookbook to hit the shelves! Let me first say I am 100% biased about this being the best Italian cookbook ever! Why? Alex is my soul sister. We became insta friends at the annual nutrition conference (FNCE) in 2014 and ever since then, I don’t think there’s been a month we haven’t talked. The recipes are so pretty you want to eat them off the page. She uses real, whole foods, and doesn’t take away the good stuff (like cheese, pasta, bread, and sauce)! I could go on, but I’ve gotta save something for your imagination to ponder until you order yourself a copy too! 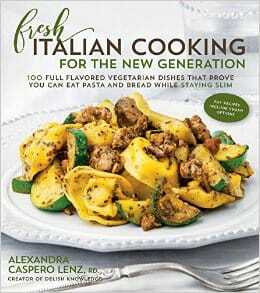 Now, in the spirit of The Recipe ReDux , I knew Alex’s book was going to make it’s debut. This month the ladies behind RR challenged us to reinvent a recipe on a page that had the numbers 2016 (or some variety) on it. Since I had preordered Alex’s book the day it became available and have used it countless times to inspire many Shaw’s Simple Swaps in the kitchen, I knew it was a no brainer that I would pull it out again. Enter, this Tomato Soup Pasta with Spinach. Now, I will admit, this recipe also come about because I was tight on time! 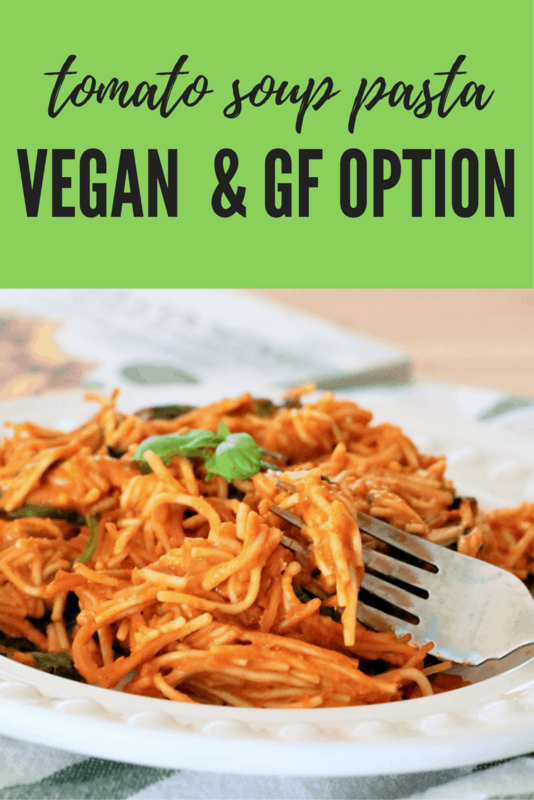 Alex has showed me through her blog, Delish Knowledge, and her fabulous cookbook that real food does not have to be complicated. Alex has a great Pomodoro Sauce over Pasta recipe in Fresh Italian Cooking and I knew the simplicity of this recipe was something I wanted to recreate with what I had on hand! So, with a box of tomato soup in hand, pasta and lots of love (and spinach), I entered the kitchen. With only one pot and many happy bellies around, I knew this had instantly become a winner. I promise, healthy eating has never tasted so good! Now, who’s ready to dive into this Tomato Soup Pasta with me?! Tomato Soup Pasta with Spinach is the easiest thing in town! Ready in just 15 minutes, you'll have a hearty and healthy meal the whole family can enjoy! And, it's vegan too! In a large pot over medium heat, add the tomato soup and spices. Stir together. Add in the dry pasta, maintain the medium heat and cook according to package instructions (usually about 10 minutes). Stir continuously throughout the cooking. Remove from heat source and add in the spinach. Tomato soup should be 90% absorbed and pasta slightly al dente. Serve with a fresh garden salad and optional shaved parmesan on top! *I used Pacific Foods Tomato Basil Soup and Barilla's latest Pronto Pasta that boils in one pot! Tell me, what’s your favorite cookbook? Be sure to check out the other fabulous recipes from this month’s The Recipe ReDux to inspire you too! I’m loving Alex’s cookbook so I used it for my Redux too! This sounds delicious- you really can’t go wrong with anything Italian. Have a great holiday friend! Heading to check yours out right now— couldn’t agree more! Love her cookbook! mmmm I gotta get that cookbook! Yum, this looks so good and Alex is so great, I agree! 🙂 Good people know good people! I am going to order that cookbook based on this dish! 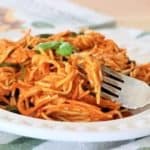 It sound so fantastic and I completely agree that pasta is a great way to add in a bunch of super foods. Plus who doesn’t love a one pot meal!!! I love that you cook the pasta in the sauce- so convenient! Using real, whole foods without taking away the good stuff… I have to check out this book! Does this work with regular pasta? We are in need of gluten-free! I’ve never tried it but the key is using the quick cooking pasta! If you can find a GF variety like that it may work :)! I make these all the time (mostly without the spinach) but I need to start adding spinach in! Great idea for sneaking in a veggie! Such a smart idea to use tomato soup! This is such an easy recipe, love it! Seriously why didn’t I think of this year’s ago?!?! Yum!! A new family favorite! Yum!